Every day, tens of thousands of girls become child brides, violating their rights and darkening their futures. But when girls are empowered to fight back, the sky is the limit. Every day, tens of thousands of girls become child brides. 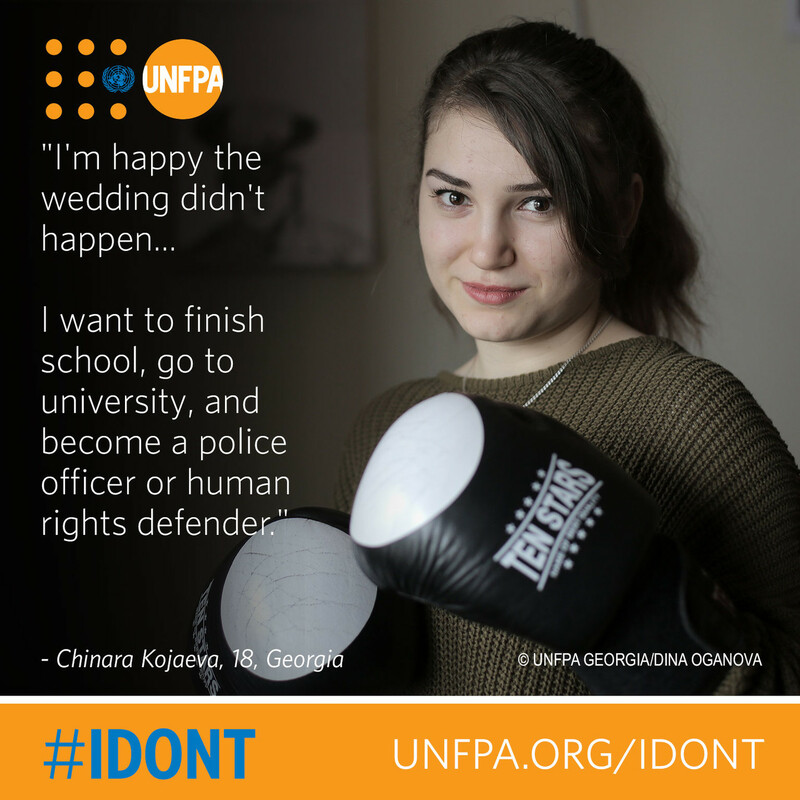 Child marriage violates their rights, threatens their health and darkens their futures. But when girls are empowered to fight back – to refuse or escape child marriage – the sky is the limit. This Valentine’s Day, we explore what happens when girls say “I don’t”. Globally, one in every five girls is married off before age 18. But girls like Kakenya Ntaiya are rejecting this practice. “I grew up in rural Kenya. The traditional way of life for girls was to undergo female genital mutilation in preparation for marriage at a young age,” she told UNFPA. “I escaped child marriage and fought for my education.” She went on to establish Kakenya's Dream, a nonprofit organization that uses education to empower girls and transform rural communities. Child brides often drop out of school. But educating girls can break the cycle of poverty. In Iraq, Elaf had two teenage sisters drop out of school after marrying. “Both sisters wish they had not married at an early age,” she said. “My dream was being a pharmacist, so when my father decided that I should get married at age 15, I refused.” Now 26, Elaf is a pharmacy student. Young brides often become pregnant while still adolescents. And unmarried girls who find themselves pregnant are often pressured to marry. Adolescent pregnancy increases the risk of pregnancy complications. Having one’s dreams shattered takes a toll, too. Yet families often resort to child marriage because they see it as a girl’s only option – a belief fuelled by poverty, insecurity and gender inequality. The girls involved in these marriages are extremely vulnerable. They may be exposed to violence, and are often unable to advocate for their needs and rights. Child marriages take place all over the world, across a wide range of communities and religions. But when girls know their rights, they can stand up for themselves. In Georgia, Chinara Kojaeva’s parents tried to marry her off at age 15. “I contacted police, and later my parents promised me they would allow me to receive an education and not marry me off until I turned 18.” But when she was 17, they again tried to force her to marry. She told authorities, and then moved into a shelter. There, she is attending classes and learning to paint and box. “I started new life here,” she said. The UNFPA-UNICEF Global Programme is reaching millions of girls and community members with information and services to end child marriage. Still, child marriage is not declining fast enough. If efforts to end child marriage are not accelerated, over 150 million more girls will marry by 2030. For those who do escape child marriage, a lifetime of opportunity awaits. “I’ve seen married young girls leading an unhappy life,” said Rukaiyah, in Indonesia. She endured years of ridicule when she refused to marry young. “I turned a deaf ear when friends mocked me, calling me ‘old virgin’.” Instead, she poured her energy into supporting women’s rights and building her own chip-making business. Today, she has a large staff and a happy family. “I believe that women need to be able to develop their talents and seize every opportunity for their future,” she said.